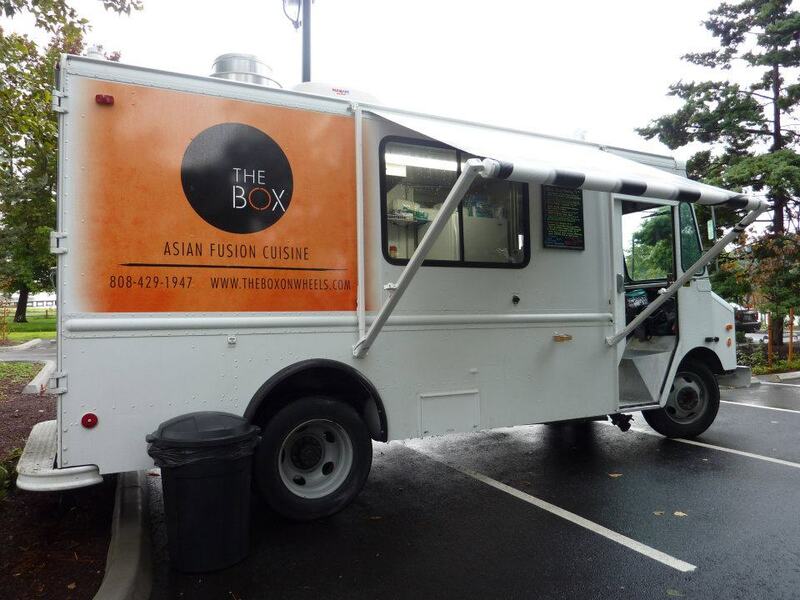 The Box is a lunch truck, restaurant, and catering company based in Kirkland, Washington specializing in creative, affordable, Asian fusion cuisine and led by Executive Chef/Owner, Reis Llaneza. And finally, a little Eastside love. The Box makes absolutely perfect Karaage Chicken. So sticky and good it’s worth driving all the way to their usual Redmond/Bellevue/Kirkland stops. And they do this amazing thing with salad — it’s so simple, but probably one of the best I’ve had from truck OR restaurant. You really do have to try it to believe it! 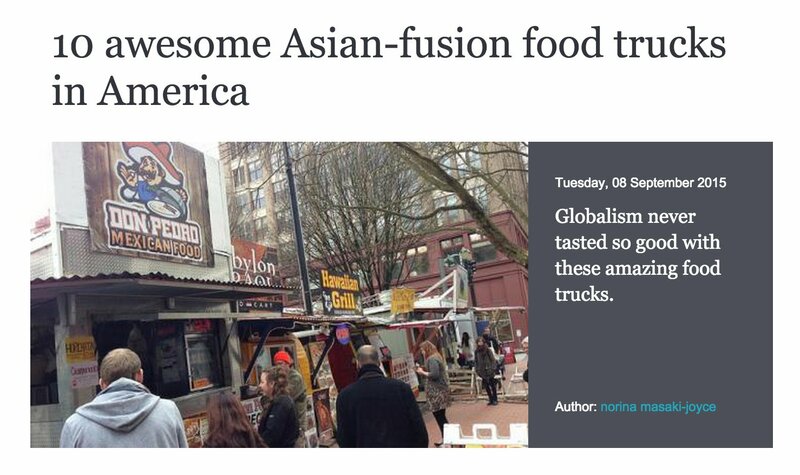 The Box on Wheels Selected as 1 of 10 awesome Asian-fusion Food Trucks in America! SkyScanner, a free online travel search engine, recently selected The Box on Wheels as one of 10 awesome Asian-fusion trucks in America! 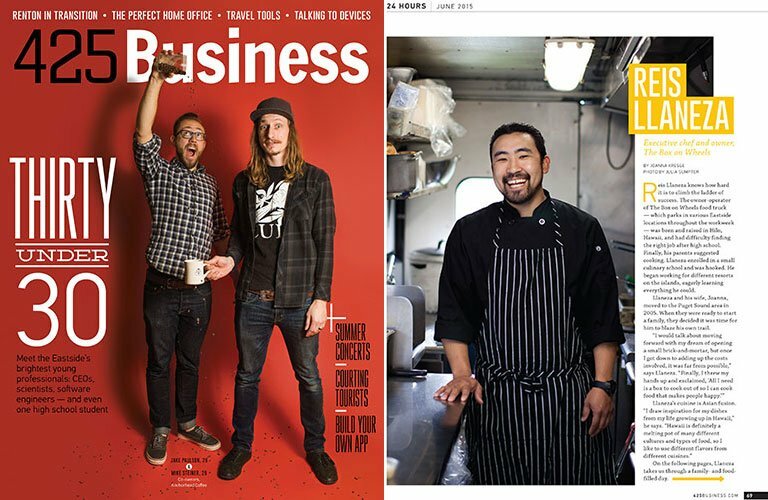 Check out chef Reis Llaneza’s feature in the June 2015 issue of 425 Business Magazine. 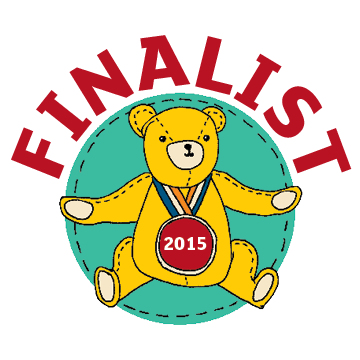 The Box Food Truck is a Golden Teddy FINALIST! Puget Sound Kids and Families voted us a FAVORITE in ParentMap’s Golden Teddy Awards of 2015! ParentMap, the go-to award-winning parenting media here in the Puget Sound, has surveyed its readers on the best businesses and resources for kids and families. We were voted as a finalist in the Food Truck Category! We have the best supporters ever! Thank you so very much! Leave it to the Eastside to one-up us with incredible pan-Asian food from a mobile kitchen. Serving the Microsoft campus in Redmond most days, The Box’s slow-braised pork belly hum bao and chicken karaage are worth defying the traffic gods of the 520 to get to. Recently, the website Eater asked readers to name the one food truck dish they couldn’t live without, and the tipline and comments were flooded with responses. The suggestions ran the gamut from desserts, to spam sliders, to fish tacos to the amazing dish from the little known truck you might never have heard of. Yeah, that one. 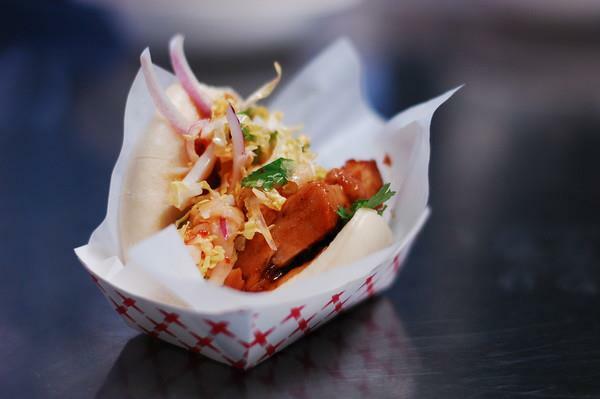 The Box on Wheels has been selected as one of 21 food trucks with big props to the pork belly hum bao and savory-sweet chicken karaage dishes. Affordable Asian cuisine is what The Box is all about. Based in Kirkland, it’s a lunch truck and catering company led by Reis Llaneza, formerly of Yarrow Bay Grill and Flo. What got props on this list is the pork belly hum bao ($2.75): slow braised in soy and mirin topped with a fresh slaw, served on a Chinese steamed bun. 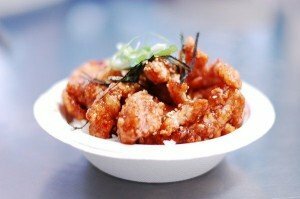 The Box’s crispy savory-sweet karaage chicken also gets a shout out. Best of the Fest at the 2012 Kirkland Summer Fest! The Box on Wheels was voted the “Best of the Fest” at the 2012 Kirkland Summer Fest! Thank you all who came out to visit us that day. You can now find us on Yelp! The Box on Wheels was recently featured in Kirkland Patch’s Restaurant Reviews. “I’m not really a ‘school’ person. I like being creative with my hands. I don’t enjoy sitting quietly to read a book,” says Llaneza who dropped out of drafting courses and found his passion in the kitchen. He graduated from culinary school in Hawaii and worked under the James Beard celebrated chef Mauro James in Oahu. When the bummer economy foiled Reis Llaneza’s plan to open a restaurant, he did as many have done and decided to go mobile. That was a year ago. Now Llaneza, a vet of Yarrow Bay Grill, Bellevue’s Flo Japanese Restaurant, and a long list of spots in Hawaii, is cruising the streets of Kirkland in The Box on Wheels.